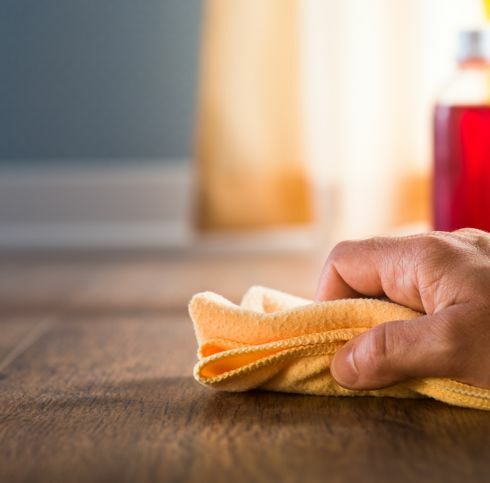 Laminate flooring is extremely hygienic and easy to keep clean. Here are our recommendations to keep your laminate floor looking beautiful for many years. Use a damp mop to remove footmarks and most stubborn dirt. Always be sure that your mop has been thoroughly wrung out. Never wet mop, or use excessive amounts of water on your the laminate floor. Marks and stubborn stains can easily be removed with Acetone™ nail polish remover or other mild, solvents containing alcohol. Use felt protectors or approved nylon pads under furniture and replace all hard plastic or metal rollers on furniture with soft rubber rollers.